5,000 ± sq. ft. lot with a vacant 5,318 ± sq. ft. 8-unit apartment building in poor condition. The property is zoned T4-0/General Urban Zone. LAND WITH DWELLING Per the stated Terms of Sale, this property is sold AS IS WHERE IS. 5,000 ± sq. ft. lot with a vacant 5,318 ± sq. ft. 8-unit apartment building in poor condition. 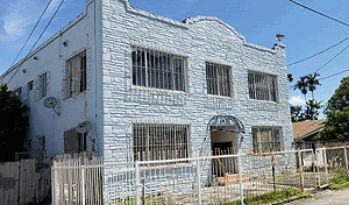 The fenced lot has 50 feet of frontage along 38th Street and is adjacent to 175 NW 38th Street which is also being auctioned. The property offers street parking only. Auction will be held at the Greater Ft. Lauderdale/Broward County Convention Center, 1950 Eisenhower Blvd, Ft. Lauderdale, FL 33316 along with 7 other properties. Click to view the auction order flyer.